The BOS Publications team is now working actively to continue the publication of booklets containing diagrams for models, and also texts on the history, theory, and practice of origami, and related subjects. You are encouraged to submit any manuscripts for consideration for publication by the team. If your work is accepted, we will help you present your work so it fits the BOS house style, and work with you to ensure your work is presented in the most attractive and saleable form. If you want, we’ll advise you on drawing techniques and styles. We regret that we are unable to provide any royalties or fees to booklet authors, but you will receive free copies. We also produce bi-annual Model Collections to accompany our conventions. 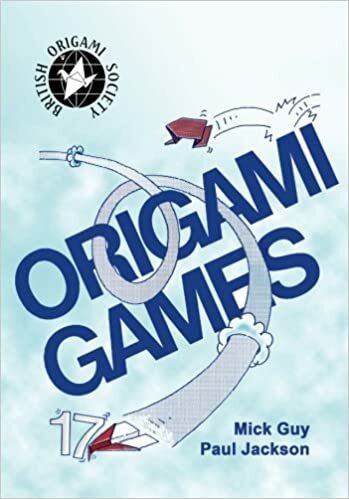 Now back in print with a new colour cover and textured page interior, Mick Guy and Paul Jackson present a plethora of competitive folding in the form of games which can be played by folding a simple piece of paper into a games piece. The book is illustrated throughout in a cartoon style by Paul Jackson. An ebook version will also soon be available from BOS Supplies. The final work by Jeff Beynon will soon be available as a tribute to this extraordinary origami model designer who had a unique intricate and decorative illustration style. A reissue of the classic work by the late John Smith – a mathematical language to describe an origami model folding sequence. Your own train set from a simple piece of paper including the fabled Stevenson’s Rocket. Buy your ticket today! This booklet is not available as an ebook. The fourth volume in Giles Towning’s Origami constriction series. Highlights include a spinning globe, rings, working slinky, working Mexican jumping beans and robot masks. As a teaser for this booklet, you can download templates to make a “Blue Globe” and an “Earth Globe”. This is a vastly expanded version (over 200 pages) of the original BOS booklet and is available in full colour for the first time. Now available again; 50 Anniversary BOS T shirt.